CGPSC State Service Pre Result Check Here. CGPSC State Service Pre Answer Key Check Here. CGPSC State Service Pre Exam Admit Card Check Here. CGPSC Notification is out. CGPSC is recruiting for 160 State Service Exam Pre 2019 Posts. 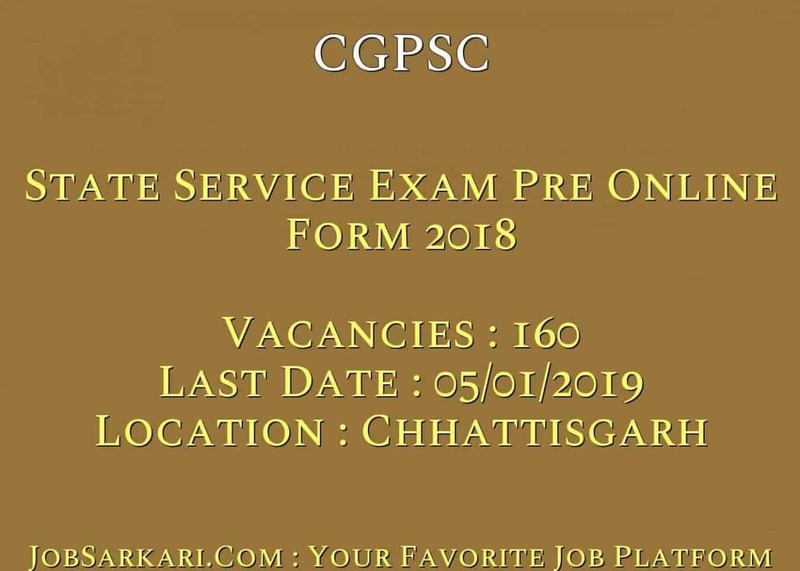 You can check CGPSC - Chattisgarh Public Service Commission last date, download CGPSC notification, visit CGPSC official website and check other CGPSC Vacancy details.Complete Vacancy and recruitment Details about 160 State Service Exam Pre 2019 vacancies in CGPSC are provided below by JobSarkari.Com only for you. Last Date for Apply Online form 05/01/2019. Last Date for Correction in Application Form 08/01/2019 to 14/01/2019. Date of Preliminary Examination. 17/02/2019. Mains Exam Date 21-24 June 2019. General / Other State Rs.400/-. State Civil Services 01 00 00 02 00 03. State Police Services 04 01 02 02 00 09. State Account Services 04 01 01 03 03 12. District Jail Superintendent 02 00 00 01 00 03. District Fighter (City Service) 01 00 00 00 00 01. Commercial Tax Officer 03 01 01 02 00 07. Assistant Registrar (Cooperative) 02 00 00 00 00 02. C.G. Subordinate (Account Service) 07 03 02 05 22 42. Inspector Commercial Tax 17 06 05 12 00 40. Inspector Excise 09 03 03 07 00 22. Dy. Registrar 02 01 00 01 01 05. Assistant Jail Superintendent 05 02 02 05 00 14. Total No of Post 57 18 16 40 26 160. Maximum Age for Police 28 Years. Maximum Age for All Other Post 38 Years. 2.Candidate Need to Register Before Applying for the Post. 3.After Registration System Will Generate a Login ID and Password. Login With ID and Password to Complete the Application Process. 4.Fill All the Mandatory Details in the Application Form. Upload the Scanned Copy of Documents in the Prescribed Size and Format. Q. What is the Last Date For CGPSC State Service Exam Pre 2019 Vacancy ? A. Last Date for CGPSC State Service Exam Pre 2019 Posts is 05/01/2019. Q. What is the Form Type of CGPSC State Service Exam Pre 2019 Recruitment ? A. 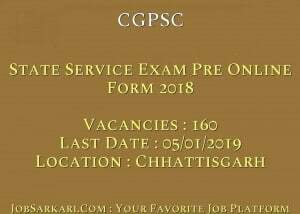 The Form Type for CGPSC State Service Exam Pre 2019 Posts is Online. Q. How many vacancies are available in Chattisgarh Public Service Commission State Service Exam Pre 2019 Posts ? A. There are about 200 Vacancies in Chattisgarh Public Service Commission State Service Exam Pre 2019 Posts. Q. What is the Full Form of CGPSC ? A. Full Form of CGPSC is Chattisgarh Public Service Commission .